Dhaka, 3 Mar, Abnews: Twin attacks on the French embassy in Burkina Faso and the country’s military headquarters Friday left dozens dead or wounded, security sources said. The government said the attack on the military was a suicide car bombing, adding that a regional anti-terrorism meeting may have been the target. “The vehicle was packed with explosives” and caused “huge damage”, Sawadogo said, adding that it was a “suicide” attack. French government sources said there were no French casualties and described the situation in Ouagadougou as “under control”. “Our country was once again the target of dark forces,” President Roch Marc Christian Kabore said in a statement. The violence began mid-morning when heavy gunfire broke out in the centre of the Burkinabe capital Ouagadougou. Sawadogo said a meeting of the G5 Sahel regional counter-terrorism force was supposed to have been held at the headquarters but had been moved to another room. “Perhaps it was the target. We do not know at the moment. In any case the room was literally destroyed by the explosion,” said Sawadogo. The completed force will be composed of 5,000 troops and aims to be fully operational by the end of the month. Mahamadou Issoufou, Niger’s president and the current chair of the G5-Sahel, said Friday’s attacks “will only strengthen the resolve of the G5-Sahel and its allies in the fight against terrorism”. “More than ever, Africa and the international community must mobilize to stand together against this barbarity that must be permanently neutralized,” added Guinea’s President Alpha Conde in a statement. Macron, who made a high-profile visit to Burkina Faso in November, said the attacks “illustrate once more the threat weighing on the entire Sahel region”. Foreign Minister Jean-Yves Le Drian said damage to the embassy was minor, and the mission would be able to resume normal operations “in two or three days”. 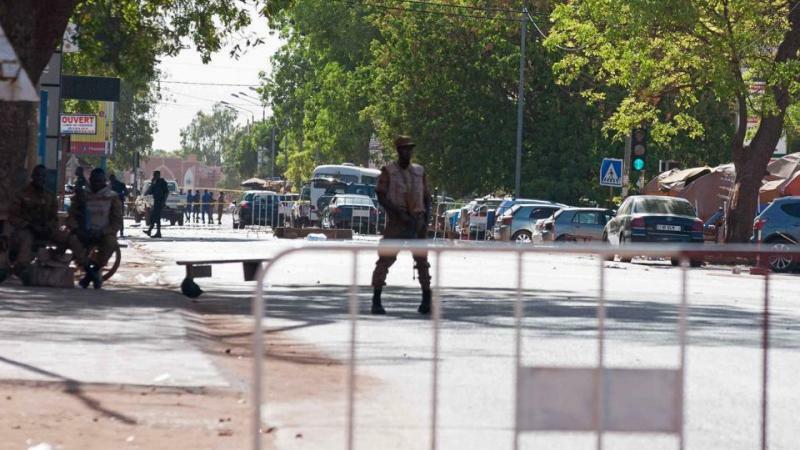 There was no immediate claim of responsibility but Burkina Information Minister Remis Fulgance Dandjinou said the attack “has strong overtones of terrorism”. Burkina Faso has a history of military-backed coups as well as of jihadist attacks. On August 13 last year, two assailants opened fire on a restaurant on Ouagadougou’s main avenue, killing 19 people and wounding 21. No one has so far claimed responsibility. That attack was claimed by the Al-Qaeda-linked Al-Murabitoun group, which was led by one-eyed Algerian jihadist Mokhtar Belmokhtar. France, the former colonial power in the Sahel region, has deployed 4,000 troops to support the five-country G5 joint force. On February 21, two members of the French counter-terrorism force were killed by a landmine near Mali’s border with Niger and Burkina Faso. Twelve French soldiers have died since the campaign, called Operation Barkhane, was launched in August 2014.